Pretty much everyone understands that good news tends to bore the crap out of people, while bad news endlessly fascinates them. That’s why don’t see a lot of headlines about how many planes landed safely at JFK airport yesterday. The whole “if it bleeds, it leads” thing is especially prevalent when it comes to law enforcement. Police officers save people from a lot stuff, including house fires. But it’s not always the kind of thing the media has interest in. 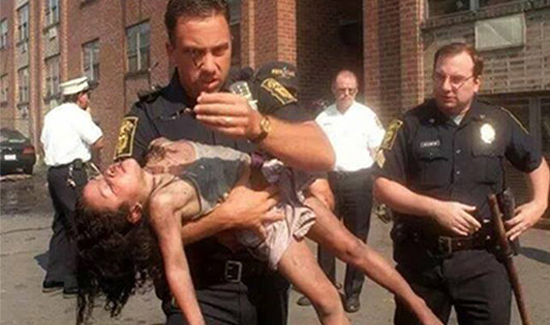 Eighteen years ago, Hartford, Connecticut, Police Officer Peter Getz was handed an unresponsive and seemingly lifeless 5-year-old girl by a firefighter at the scene of a massive blaze. He knew right away that every second mattered. He put her in the back of the vehicle and started CPR, while his partner drove like hell to the ER. The girl, Josi Aponte, is now all grown up and she recently graduated from college. “I’m told that if he would have just waited a few more seconds for the ambulance to come in, I could have died,” Aponte told NBC Connecticut. And the officer that made that possible was there to see it.